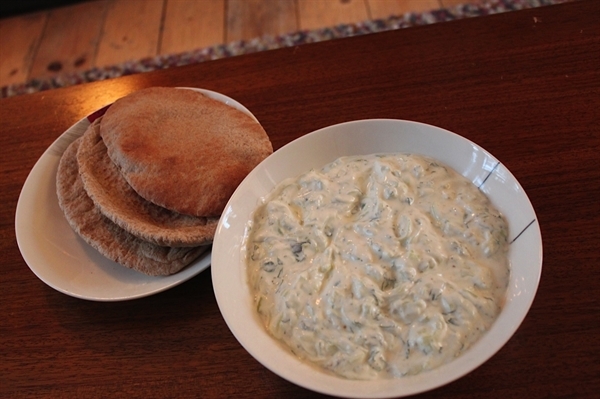 Tzatziki is great as a dip with fresh vegetables or bread, but also goes amazingly with lamb burgers or lamb chops. 1. Peel cucumber and remove seeds. 2. Grate into a sieve and add some salt to enable some of the juice to release then pat dry with kitchen roll. 3. Mix the cucumber into the yoghurt, with a big glug of rapeseed oil. 4. Add the mint and garlic and season well with salt and pepper and a squeeze of lemon. 5. Leave in the fridge for half and hour before serving. A healthy alternative to snacking on crisps, kale chips are high in vitamin C and are considered a'nutritional powerhouse'! 2. With a knife or kitchen scissors carefully remove the leaves from the thickstems and tear into bite size pieces. Wash and thoroughly dry kale with a saladspinner. 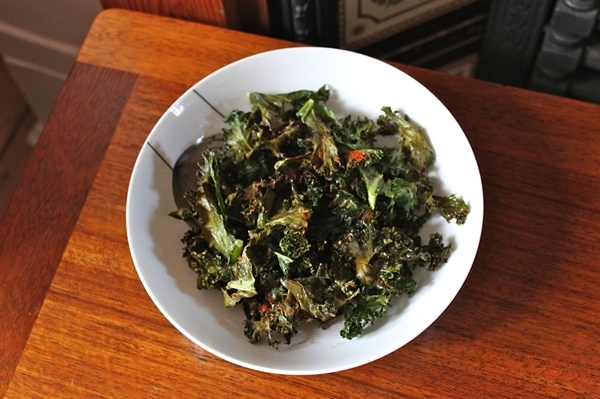 Drizzle kale with oil and sprinkle with seasoning salt. 3. Bake until the edges brown but are not burnt, 10 to 15 minutes. Try substituting sesame oil and soy sauce for a different flavour. Youcan also experiment with different seasonings - chilli flakes taste great. A colourful, summery side dish making use of new season cabbage and carrots. Quick to put together and very tasty. 1. Finely slice the red cabbage and red onion, and grate the carrots. 2. Mix in a large bowl with the lemon juice, mustard and white wine vinegar. 3. Lightly toast the seeds in a pan taking care not to burn and mix in. 5. Add mayonnaise according to your preference. A vibrant herb sauce bursting with flavour. Excellent with fish and meat. Place all the ingredients in a food processor and gradually add olive oil while blitzing until desired consistency is reached. For a coarser texture chop and mix ingredients by hand. Peel the onion squash, cut in half and de-seed. 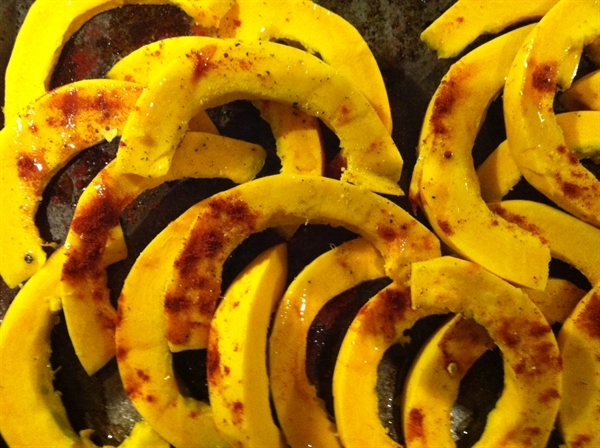 Slice squash into thin-ish wedges and place on a baking tray. Pour over as much olive or rapeseed oil as you like - the more oil the more crispy the 'chips' will be. Sprinkle with hot smoked parprika and salk and pepper to taste. Put in oven and bake for around 20-25 mins shaking the tray occasionally to stop sticking until chips are browned and soft. From North Maldon Growers, Goldhanger Lane, Maldon, Essex. When I was a child, we only ever had beetroot out of a jar, packed in vinegar. I actually quite like pickled beetroot, but the first time I tasted it done like this – having lunch with a family in Brittany on my year out – I was totally hooked. This is the kind of dish I could happily eat all of, late at night standing by the fridge if I’ve got the munchies. 1) Get a large sheet of aluminium foil and butter it. Preheat the oven to 180 centigrade, 160 fan. 2) Wash the beetroot but do not peel it. Put them on the foil and make a tightly sealed parcel. Bake this in the oven for one hour. 3) Meanwhile, make the vinaigrette. Squash the garlic with the salt and crush them together to a paste, either on a chopping board or with a mortar and pestle. Mix the mustard with the vinegar and then add the oil and the garlic mixture, with the pepper. The garlic will have the effect of emulsifying the vinaigrette so that it does not separate. 4) Take the beetroot out of its foil and peel it while still hot. Cut into cubes and put in a bowl with the vinaigrette, stirring well. Cover with cling film and allow it to cool. When you’re ready to eat, sprinkle over the parsley and stir in. Absolute vampire-repelling heaven! This is my take on a Victorian classic. I’m not entirely sure where the use of apples in bread came from, but it may be to do with needing something sweet to grow the yeast. Don’t be put off at the thought, the apple puree makes the bread moist but the apple flavour is not pronounced. Try the great new flour range from Farm Direct for this lovely home-made bread. 1) Peel and core the apples, then chop them coarsely into a saucepan with about 4 tablespoons of water. Put the lid on and heat over a moderate heat until the apples begin to ‘fall’ (go mushy). Lower the heat and cook for 5 minutes, then beat furiously to a puree. You don’t want lumps. 2) Transfer this puree to a bowl and add the sugar, stirring well. When it is just warm to the touch, add the yeast, stir and leave for 30 minutes. 3) Mix in the flour, salt and 120ml warm water. Add the grated cheese and mix to a rough dough. 4) Lightly oil your work surface and transfer the dough on to it, kneading well for about 5 minutes until it is nicely elastic. Put it back in a clean bowl and cover with a damp tea towel. At this point you need to leave it to rise. Depending on your timing you can do this for a couple of hours in a warm place, or overnight in the fridge. 5) When the dough is doubled in size, turn it out onto the surface and give it another knead to knock the air out of it. Tease the dough into a ball shape and put ona baking tray on top of the oven to prove. Heat your oven to 200 centigrade, 180 fan and let the dough rise up again to twice its volume. No need to cover it, as letting it dry out a bit will give you a better crust. 6) Put a bowl of water in the bottom of the oven, then bake your loaf for 20-30 minutes until nicely brown and sounding hollow when you tap its bottom. Put it on a wire rack to cool so that it doesn’t go soft underneath. This is nice as it is, slathered in butter or cream cheese, but goes really well with a good soup!! Swede are often overlooked as something cheap to be mashed with potatoes or served just boiled with butter. They have a sweet, distinctive taste and were actually used in wartime as fake pineapple! This recipe combines that oniony sweetness with smoked garlic and bacon,and grilled cheese. It’s a great dish to accompany a roast dinner or even as a supper by itself, with some crusty breadand a salad. Vegetarians could replace the bacon with some sweated leeks or mushrooms. 1) Put the diced swede into a bowl and cover with boiling water for 10 minutes. 2) Drain and put into a saucepan with the milk and smoked garlic. Bring to the boil and cook over a fairly gentle heat for about 10 minutes until tender. 3)Lift the swede out of the milk with a slotted spoon and place in a small gratin dish about 15cm by 20cm. Leave the garlic in the pan. 4) Whisk in the butter and flour, a pinch of salt and a grind of pepper. Whisk it quite vigorously to avoid lumps, and bring back to the boil to thicken. 5) Cut up the bacon into small pieces and mix in with the swede before pouring over the sauce. Mix around to coat everything nicely , then top with the cheese and cookin a preheated oven at 200 centigrade, 180 fan for 20 to 30 minutes until the cheese is golden and bubbling. Absolutely delicious, and even eaten by those who don’t normally like swede! The French have areal thing for savoury cakes, which for some reason does not seem to have filtered over to the UK as yet. I have to say that when I was first introduced to the concept I did find it a little strange! However, after some experimentation I have been well and truly converted. These are lovely served hot for supper with some good mayonnaise and a salad, or as very portable and original picnic food. There are endless combination possibilities, but here is an easy one to get you started – the children really like it and it’s great for packed lunches with a difference. 1) Preheat the oven to 160 fan, 180 centigrade. 2) Fry the bacon with the onion and leek in the tablespoon of oil until the vegetables are soft and the bacon cooked. 3) In a bowl, combine the eggs, olive oil, balsamic and cream. Add the flour and baking powder,followed by the cheese and milk, stirring well. 4) Grease and line a 750g loaf tin. Add the contents of the frying pan to the other ingredients and pile this into the loaf tin. Level off and bake for around 35 minutes until well risen and golden. There is no need to test with a skewer, as some softness in the middle is not necessarily a bad thing! 5) Turn out onto a wire rack and allow to settle for 5 minutes before slicing and eating! From Seddon & Sons, Homestead Farm, Ormskirk, Lancs. With a light texture and bright colour, our all-purpose flour, milled from selected organic wheats, is perfect for general baking.